In the market for data integration one of the leading manufacturers is Informatica. This company is the leading independent provider of data integration software. His most popular tool, and the heart of his platform is Informatica PowerCenter, which has gone through many versions, and is a reference in the world of integration. But apart from PowerCenter, Informatica also provides other tools that focus on more specific purposes, while that is integrated into the platform, and always in the context of data integration. The Informatica platform 9 is designed to cover the full life cycle data integration, which consists of five main steps: access, screening, cleaning, integration and delivery. As usual with major software vendors, Informatica has many products, options and issues, and may cost a bit to get an idea of ​​what each does, and what we need and what's not for our needs, but the fact that Informatica is an independent provider dedicated exclusively to data integration software greatly facilitatesthings. This article will give an overview of the main products that Informatica platform 9, grouped by type of problem they solve, and will provide a brief description of each. The Data Integration products are those with a more generic and, to make an analogy, we could compare with ETL tools from other manufacturers. It might be called the flagship of Informatica. Connect to multiple data sources in real time, batch capture or even changes in the data (CDC). Like other ETL tools, to define and apply the changes necessary data and then distribute them to target systems as appropriate. I would emphasize the ease of use of its visual development tools, performance, scalability, expandability and functionality by the purchase of options 'Extra' and integration with other applications of the platform. There are three product editions, each designed to cover a type of requirements. They are the Standard Edition with the basic options, the Advanced Edition which includes more advanced options, and Real Time Edition, which is oriented toward the integration of real time data. This tool allows direct access, process and distribute data found on platforms in many instances require passs interim order to manage with a standard ETL. PowerExchange to connect with SaaS (Software as a Service), all kinds of databases, Email, LDAP, Web Services, XML, etc. In an advanced version Complex Data Exchange can even work with complex data formats such as EDI, HL7, SWIFT, EDIFACT, etc. With some of these platforms can work in real time, or even use the technology CDC (change data capture), which detects changes to data non-intrusively and without OverloadArgar and the source system with unnecessary queries. It also integrates with Informatica PowerCenter and Informatica Data Quality. No need to say much to define this group, all tools designed to give help in improving the quality of data companies are here. Profiling tool is Informatica's data.Easily perform data profiling column level, table and between tables, which christens Informatica Data analysis in three dimensions that can work on complex data. From the analysis and profiling are generated metadata, related sources and destinations, and create reports quand to control the whole process of data quality, the anomalies, weaknesses and improvements over time. It also integrates with Informatica PowerCenter and Informatica DataQuality to view results, create mappings automatically, or display specifications for cleaning and data transformation. Data Quality has a broader scope than Data Explorer, is designed to manage the entire process of data quality, profiling, specification, cleaning, validation and monitoring, allowing him to participate in a coordinated manner both data analysts and developers and administrators .Each one has its own profile-oriented interface, and accessible in a web environment. Of its functionalityDad is the possibility of defining rules and quality services that can be reused in different projects of data quality. It also has predefined rules to cleaning and geocoding addresses for more than 60 countries. Informatica Identity Resolution The identity resolution software to detect records that appear in the system as different individuals, but by the similarity between values ​​associated with them can be deducted under the same identity.In other areas this process is called deduplication also customers, and can not be missing from a data quality project. Informatica Identity Resolution combines similarity comparison algorithms efficiently Takes into account any typographical errors, changes in data and even compare data reported in languages ​​and even different alphabets. Processes can run in both batch and real time, and has API's that allow detection capabilities include identities other applications. 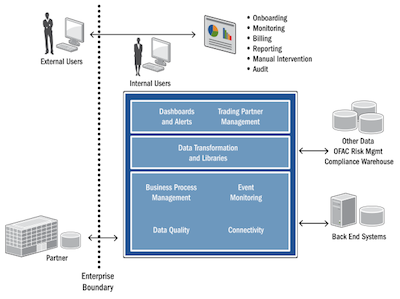 This group encompasses the tools used to facilitate data integration with other businesses, with the outside world, where the manner of access to information, standards and protocols change, and where it is vital to ensure the quality of incoming data, and not compromised the security of internal systems. This family of products consists of Informatica B2B Data Exchange and Informatica B2B Data Transfor mation is aimed at the effective exchange of information between enterprises, and offers great flexibility in format, supporting both structured and unstructured. The tools are integrated with the rest of the Informatica platform, and external data collection also incorporate the necessary security measures that can be integrated seamlessly with internal data. Informatica B2B Data Transformation and processing functions are provided as a user-friendly to step outside internal data easy and no programming. Informatica B2B Data Exchange can also define intProfiles erna and externally with business partners with whom information is exchanged, so that on the same platform can define rules for transactions and expedite the protocol before the start of trade. It also manages events, current and historical and enables control of transactions. The information has a lifecycle, and many data will become obsolete as time passes.The data also move and replicate in different settings, some more critical than others, and efficient management of space is important. Many of the data used need to be protected and to ensure that they can see clear the appropriate profiles. It is important to manage the lifecycle of the information, and these are the Informatica tools provided to assist in this task. Informatica Data Archive is responsible for managing the archiving, with or without compression, data at rest, so stop using space and resources in major production systems, while still maintaining referential integrity and being accessible through the tool and the various interfaces it provides. Sets rules and create metadata for archiving data, and provides direct connectivity to various databases, ERP and CRM systems, and even custom applications. Another important feature is that by managing the archiving, to analyze and actively manage the data growth. Informatica Data Subset This application is used to create subsets of data from, for example, full details of a production environment. Allows you to define these subsets and policy creation and replication or maintenance of such data from the origin of 'complete'.The software is also responsible for maintaining referential integrity within the data that form the subsets. Includes accelerators for use on various ERP's, CRM's, and can greatly facilitate the creation and maintenance of development environments of reduced size, and date. In conclusion, this application is responsible for centrally managing the masking of data required within the organization, helping to comply with data protection laws, prevent leaks of sensitive data, and facilitate the creation of environments development 100% operational, but showing no critical data. Sets masking rules and have different algorithms or ways to apply while ensuring consistency and integrity of the data masked.Noted that by decoupling allows mask data values, while maintaining the functionality and readability of the same. As expected, it also incorporates application accelerators that include predefined rules to apply maskingramiento quickly on various ERP and CRM applications.